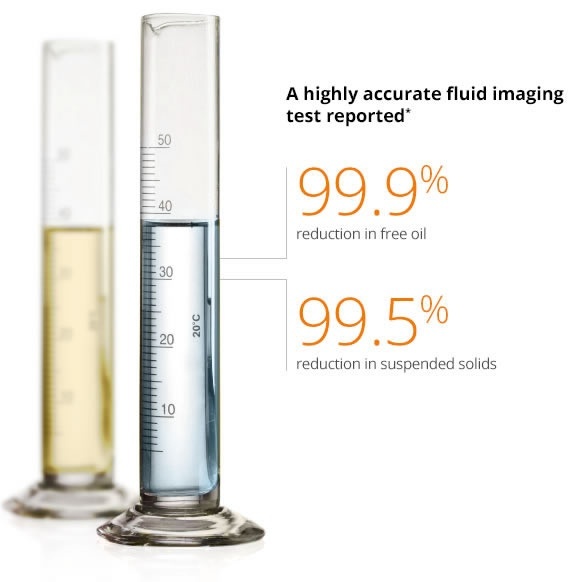 OriginClear’s proprietary Electro Water Separation™ (EWS) technology is particularly effective in the treatment of produced and frack flowback water from the oil & gas market. EWS is a continuous, chemical-free, low-energy oil gas water separator process. Exhaustive testing has indicated that Specific Energy Consumption averages 5.1 kWh/kgal of processed water. Assuming an energy cost of $0.15 per kWh, the energy cost of operating the EWS technology is estimated at $0.03 per barrel of water treated. The EWS process efficiently removes non-soluble organics and inorganics, such as free & dispersed oil and suspended solids, through sequential stages of electro-coagulation and electro-flotation. A demonstration system based on OriginClear™ technology effectively decontaminated Produced water in a pilot program at a storage and disposal site in the USA’s most productive oil county. Extensive third-party testing demonstrated that the pilot program was a technical success. The electro-coagulation process breaks the oil/water emulsion and causes the oil and suspended particles to coagulate into larger particles. EWS targets the one to twenty-five-micron size oil droplets and suspended particles for coagulation and flotation that is too time intensive to remove with standard gravity-based separation technologies. Electro-flotation creates a high-density concentration of micron size bubbles which lift the coagulated particles to the surface for separation. The result is a better-pretreated water, to enable high-quality downstream processes that would not have been possible with conventional pretreatment. In addition, the EWS technology platform offers a third, synergistic function of electro-oxidation, which is effective in removing bacteria, and certain ions that are capable of being precipitated from solution. The electro-oxidation stage has shown value when used as a stand-alone equipment for water and wastewater treatment. 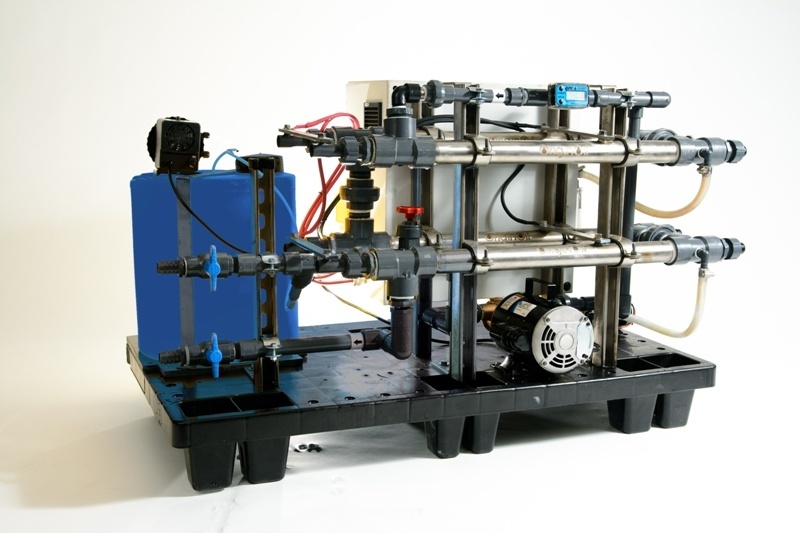 Now available, the electro-oxidation stage can be used singularly to effectively treat produced water for bacteria and hydrogen sulfide (H2S), without requiring chemicals. The process is also very energy efficient. OriginClear’s EO Toolkit is available for licensing and to end-users interested in showcase applications. Contact us now. The designs incorporated in EWS technology are unlike other electro-coagulation (EC) systems tried over the years. Earlier EC generations have historically used heavy plates as the anode and cathode, with wide gap separation. The wide separation requires high power to achieve the dosage rates required for effective coagulation. 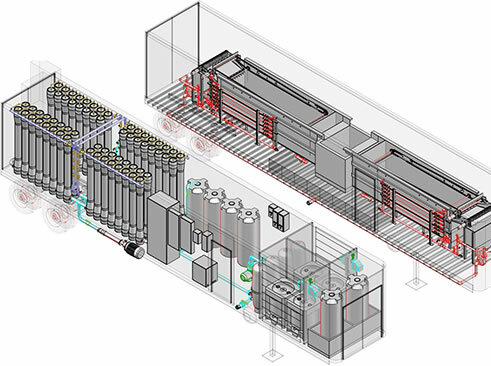 Typical EC systems have been stand-alone systems with separate pieces of equipment for gravity separation and disinfection. EWS integrates these functions into one stand-alone piece of equipment with SCADA control over all three technologies. Instead, the EWS electro-coagulation reactors use an outer tube and an inner rod as the cathode and anode with the water flowing through the annular space. The resultant narrow annular gap and high mass transfer rate minimizes the power necessary to achieve effective coagulation. The high mass transfer rates also inhibit scaling and anode passivation. As a result of the above designs, the EWS EC reactors require far less power with an estimated Selective Energy Consumption of 0.28kWh per barrel of water. Less anode consumption is seen, and the anodes are far easier to replace and maintain. EWS electro-flotation technology utilizes non-donating anodes and cathodes to generate micro-bubbles over the complete volume of water in the flotation chamber. These microbubbles are small enough to embed or attach themselves to the coalesced oil and suspended solid particles. The flotation chamber itself is also specifically designed to separate a larger percentage of the oil and solids, leaving progressively clearer water. Equipment suppliers who have technology that would benefit from EWS’s pretreatment technology, and system integrators who want to utilize EWS’s pretreatment technology, can license EWS on a private label basis. 5000 barrel per day “Frack-Back” system, designed by OriginClear licensee, Pearl Blue, using EWS technology. EWS systems have been designed to include a common SCADA control system with touch screen which will allow automatic control of the process as well as remote monitoring and alarms. Schematic for an EWS powered frack flowback and produced water cleanup system, bundled with intelligent controls, grit removal on the front end, and a post-polishing system, all in a single product. EWS has been successfully tested in a wide range of produced and frac flowback waters in the gas fields of Western Colorado, West Texas intermediate oil fields and the San Joaquin heavy oil fields of California. Each of these waters has been unique, but EWS technology has proven flexible and robust enough to handle these widely varying challenges within the oil and gas industry. In San Joaquin, third party lab results confirmed that EWS reduced all measures of treated water's non-soluble contamination to very low, or undetectable levels. November 2016: Case study: a demonstration system based on OriginClear™ technology effectively decontaminated Produced water in a pilot program at a storage and disposal site in Kern County, California. The client, a regional water treatment entity, commissioned the 60-day test, which began in July, 2016. View or download the report here. April 2017: Nicholas Eckelberry uploaded a comprehensive Case Study of our successful Bakersfield pilot program to Academia.com. The pilot demonstrated using EWS to treat produced water for beneficial reuse. View or download the report here. Summary here. Full report available on request. 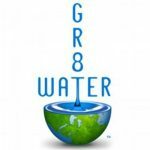 Gr8 Water – May 30, 2018: "The United Nations estimates that by 2030, water demand will exceed supply by 40 percent. By combining OriginClear’s Electro Water Separation (EWS) wastewater treatment technology with Water Technologies’ Atmospheric Water Generators, oil & gas operators facing water scarcity can regain control of their water resources and build water independence for their organization." The United Nations estimates that by 2030, water demand will exceed supply by 40 percent. By combining OriginClear’s Electro Water Separation (EWS) wastewater treatment technology with Water Technologies’ Atmospheric Water Generators, oil & gas operators facing water scarcity can regain control of their water resources and build water independence for their organization. "We go to the early adopters first," said OriginClear CEO Riggs Eckelberry. The cost-effectiveness of the new technology allows him to predict a future in which companies operate decentralized, on-site water treatment centers that recycle dirty water and push it to points of use.